The U.S. has sent Marine aircraft that can jam detonators for roadside bombs to fight Islamic State terrorists in Iraq and Syria. 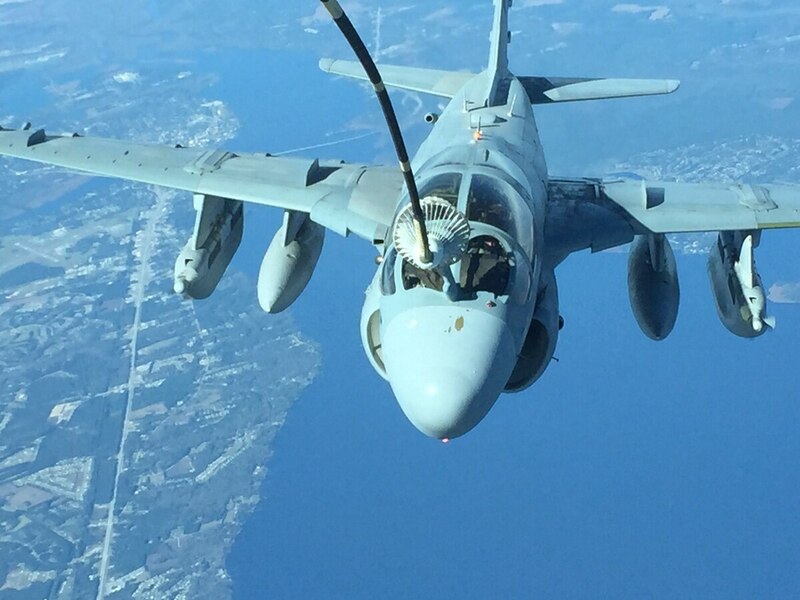 A squadron of EA-6B Prowlers has arrived at Incirlik Air Base, Turkey, for a deployment that is expected to last through September, according to a news release Thursday from U.S. European Command. The Marines and aircraft are from Marine Corps Tactical Electronic Warfare Squadron 4, based at Marine Corps Air Station Cherry Point, North Carolina, said Air Force Lt. Col. David Westover, a spokesman for EUCOM. "While a typical squadron consists of about six Marine Corps EA-6B Prowler aircraft and more than 250 Marines, for operational security reasons, I can't provide details specific to this squadron," Westover said in an email Thursday. The deployment to Incirlik comes less than a month after the Defense Department ordered hundreds of military and civilian dependents to leave the base following concerns about security. About 700 military spouses and children had to evacuate. Prowlers are built for electronic warfare, such as blocking enemy communications. During the Iraq War, Prowlers jammed enemy cellphones and radio frequencies that terrorists used to remotely detonate roadside bombs. The counterroadside bomb mission is particularly important because as the Islamic State group retreats in Iraq, it leaves mines and other explosive booby traps, said Mark Gunzinger of the Center for Strategic and Budgetary Assessment think tank in Washington, D.C.
"Those are a real problem for U.S. forces, much less Iraqi troops, so I do think that would be a priority mission," said Gunzinger, a former deputy assistant secretary of defense. However, the Prowlers' capabilities to jam enemy communications will be in high demand, Gunzinger said. 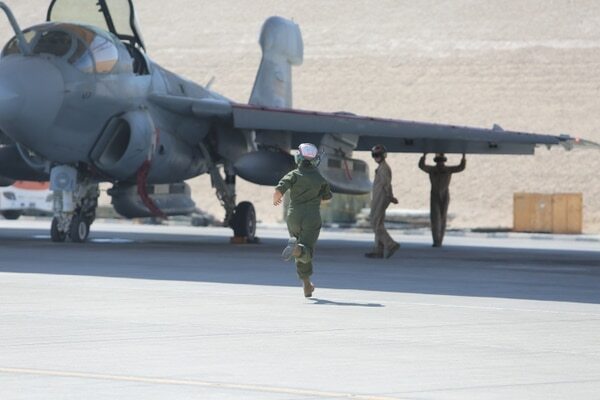 A Marine with Marine Tactical Electronic Warfare Squadron 4, assigned to Special Purpose Marine Air Ground Task Force-Crisis Response-Central Command, runs to an EA-6B Prowler. The squadron is using the aircraft, in part, to jam communications between militants with the Islamic State group. "The fact that it's a system that can disrupt ISIS' communications, disrupt their ability to command and control their forces engaged in combat operations, that's a pretty important mission," he said, using an alternate name for the Islamic State group. It's also possible that the Prowlers will be used to prevent Russian and Syrian air defense systems from tracking other U.S. and coalition aircraft, said Todd Harrison of the Center for Strategic and International Studies think tank. "These are the type of aircraft you could potentially use to counter air defenses, and as far as I know, ISIS doesn't have air defenses," Harrison said. It is possible that the U.S. is worried that Islamic State fighters could be armed with shoulder-fired anti-aircraft missiles, which Prowlers could also jam, he said. "It would basically scramble the radar systems being used against our aircraft so they can't find and track our aircraft effectively," Harrison said. 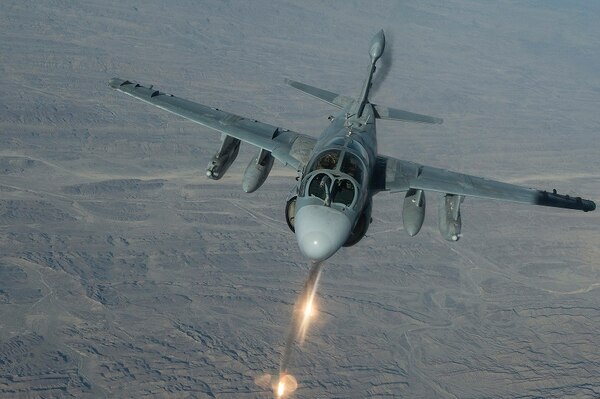 A Marine Corps EA-6B Prowler fires flares over Afghanistan in 2014. Retired Marine Lt. Col. Oliver Jenkins flew Prowlers from 1992 to 1998. During missions over Bosnia, he came to appreciate how many electromagnetic frequencies the plane can monitor at once. "I was often impressed at the capability of the EA-6B Prowler," said Jenkins, who is running for Congress in Louisiana as a Republican. In the past, the aircraft have also played a role in psychological warfare operations, Navy Capt. Chris Field said in October 2005. The planes' jammers were used to allow the U.S. to take over insurgents' broadcasts, said Field, then commander of the Pacific Fleet's electronic attack wing. "TV, radio — we can jam it, intrude on it, broadcast messages from our own system, take away their systems," Field said at the Association of Old Crows annual international symposium and convention. When the U.S. began attacking the Islamic State group, Prowlers were among the first aircraft on the scene. Marine Tactical Electronic Warfare Squadron 3 began flying missions over Iraq in June 2014, followed by Marine Tactical Electronic Warfare Squadron 4, which started flying sorties over Syria that August. "We were the first USMC aircraft in Syria on the first wave of strikes, and have continued to support strike packages, airdrops and other electronic warfare requirements as directed by the Combined Force Air Component Commander," Lt. Col. David Mueller, commander of Marine Tactical Electronic Warfare Squadron 4, told Marine Corps Times in January 2015.